Variable snow conditions mean summits of mountains can differ from year to year. One mountain whose summit is unrecognisable from when it was first climbed in 1956 is Manaslu in Nepal, the eighth highest mountain in the world and one of the 8000m peaks. Its summit has changed so much in the last half century that modern mountaineers could almost be climbing a different mountain from those pioneering first ascenders. This occurred to me as I was reading the Japanese climber Toshio Imanishi’s account of the first ascent. The 8163m mountain has a colourful history I have talked about previously in this blog, but its summit has been a puzzle to me for a few years. A friend of mine, Bunter, reached the fore-summit as part of a commercial group with the mountaineering company Jagged Globe in 2008. His summit photo showed half a dozen people sitting on top of a rounded snow dome. They had stopped there because beyond it was an exposed ridge which would only have been safe for less experienced climbers with fixed ropes in place. Imanishi’s summit photo showed a shattered rock tower barely large enough for a single person, but just how exposed was the ridge which divided the two summits? When I climbed the mountain myself in 2011, what I found was something entirely unexpected. It tallied neither with Imanishi’s rock tower nor Bunter’s fore-summit, so what on earth had happened? I hoped by reading Imanishi’s account I could unlock the mystery, but the route he described was unrecognisable from what I experienced. I had to read it several times before I could piece together the facts, and even then I could not be certain. Was it possible either he or I had recalled the features only vaguely in our exhausted state? Possibly, but it wasn’t just his description which diverged from mine; his photos were very different too. And yet, there is no doubt that we both reached the summit. How could this be? Let’s start with the photos. Here is Imanishi’s photo of Gyaltsen Norbu Sherpa standing on the summit in 1956. I have compared it with American climber Ed Viestur’s photo of the Finn Veikka Gustafsson standing on the summit in 1999. There is no question both men are standing on the same rocky summit. You can even see the distinct line which divides the lighter limestone with dark granite rock a couple of metres from the top. The summit hadn’t changed at all in 43 years, but compare it with my own summit photo from 2011, and perhaps even more starkly the summit photo of the Russian mountaineer turned kick-boxer Mila Mikhanovskaia, taken in 2012. As you can see, there’s been a wee bit more snow in the intervening years. To even tell it’s the same mountain it’s necessary to take a step back and view the panorama behind. This is best done using Imanishi’s photo of an empty summit showing three peaks – Ganesh, Himalchuli and Peak 29 – on the horizon behind. If you look carefully you will see the profile of Peak 29 matches the one seen behind my left shoulder in my own summit photo. So much for the photos, how about the route description? 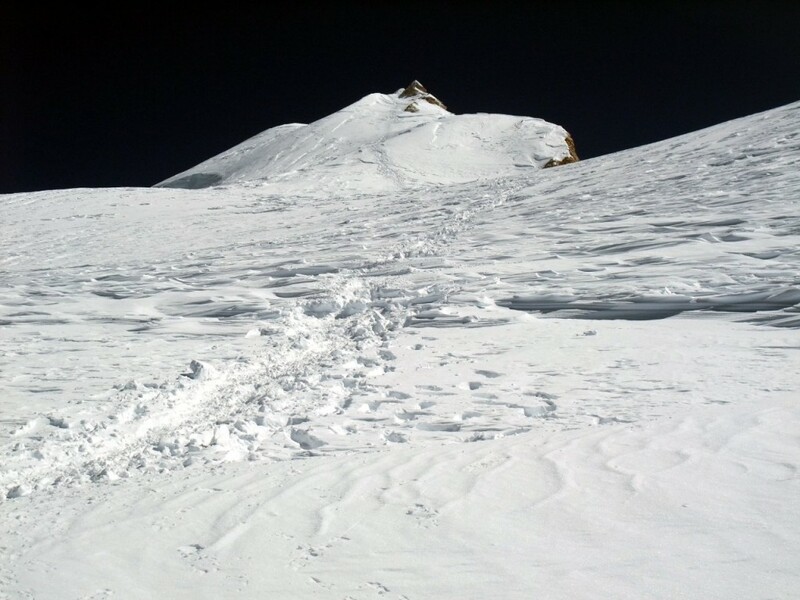 From Camp 4 at 7450m, Manaslu’s summit route is extremely straightforward. 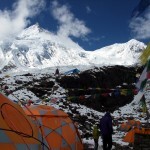 Here is the view from camp, and you can see the 8163m main summit in the centre, with Manaslu’s 7992m East Pinnacle on the left. From here it looks like just one easy snow slope all the way to the summit. This isn’t far from the truth. 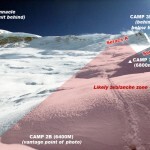 To flesh the description out a little more, I would say the summit route from Camp 4 roughly consists of three plateaus, each followed by a steep snow bank a hundred metres or so in height. Each plateau slopes upwards at a slightly steeper angle than the plateau preceding it. The third “plateau” is actually more of a steep snow slope, but it’s a good deal less steep than the snow bank beyond it that leads up to the summit crown. 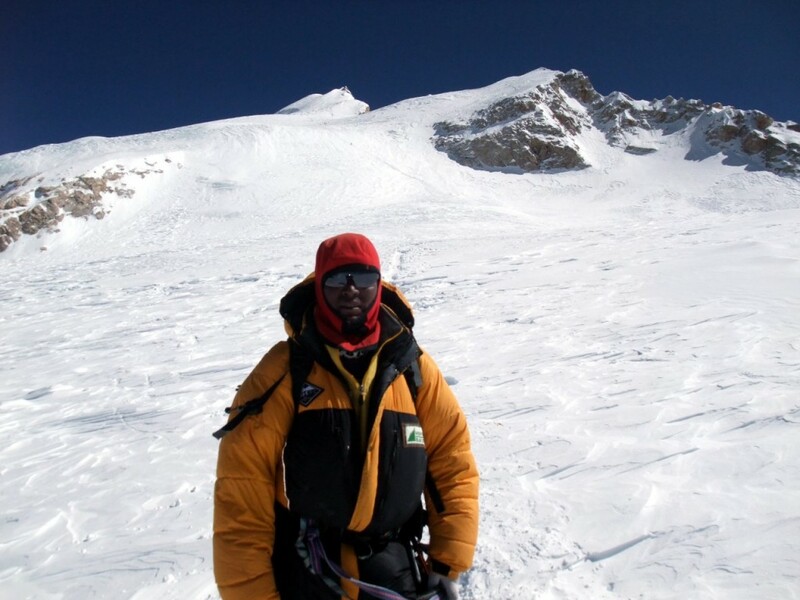 While today’s summit assault camp is pitched at 7450m at the bottom of the first plateau, Toshio Imanishi and Gyaltsen Norbu Sherpa actually pitched theirs at 7800m, leaving them only a little over 300m to climb to reach the summit. I would estimate this would put them on the second plateau, roughly where Chongba Sherpa is standing in the following photo. From here the route to the summit looks blindingly obvious, straight up the snow slope behind Chongba, and for us it was, not least because the sky is absolutely clear. Routes can seem very different under cloudy conditions, and none more so that those which cross relatively featureless snow plateaus. In 1972 Reinhold Messner lost two fellow climbers, Franz Jäger and Andi Schlick very close to this spot when a storm blew up as they were descending from the summit, and neither were ever seen again. But this wasn’t the case for Imanishi and Gyaltsen. Imanishi states quite explicitly that “the day was absolutely fine and windless”. We can see from this that instead of heading straight up the middle of the plateau like we did, the blue ice kept them to the right, so far to the right, in fact, that they would have been in danger of toppling off the edge into the Marsyangdi Valley on Manaslu’s western side. They probably ended up working their way up the rocks behind Chongba’s left shoulder in the above photo. We slowly climbed the snow face which undulated gently and was crevassed. On the right we saw two white peaks … Suddenly Gyaltsen called to me. He pointed to the left, where a triangular rock pinnacle covered with snow rose sharply from the wide snow field. Otsuka had been right when he had advised me earlier to take a few rock and ice pitons along. It seemed to us that we had taken a round-about way. Again, this is nothing like the route we experienced. On the left you can see a view looking up the third plateau, with the third snow bank above, leading directly up to Manaslu’s summit crown. As you can, there is no danger of taking a round-about way in clear conditions. The route does not undulate gently; it simply goes straight up the snow slope. At no point do two white peaks appear on the right, and nor does a rock pinnacle which requires rock and ice pitons rise on the left. I can only account for this by assuming they must have been working their way along an undulating ridge to the right of the plateau in this photo, a ridge that does indeed undulate and wind left and right when there is much less snow. The rock pinnacle is probably the snow bank and summit crown seen in these drier conditions. 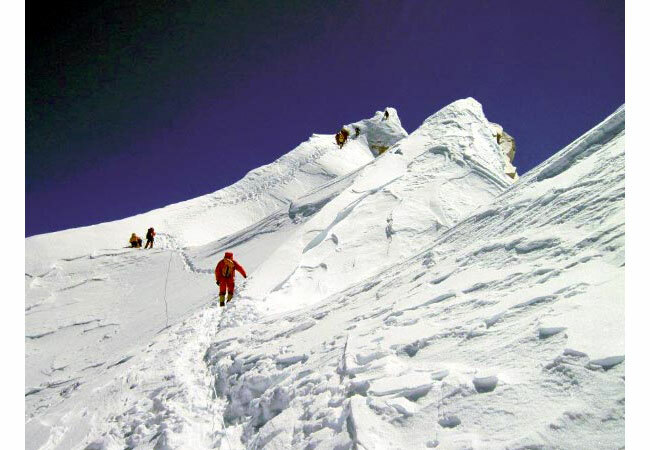 People often talk about Manaslu having a fore-summit, but this is misleading, at least to most people who have climbed the mountain more recently (my mate Bunter being an obvious exception). This is what we saw when we reached the top of the third snow bank. 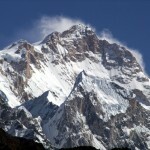 I call it Manaslu’s summit crown. As you can see, there are indeed a series of fore-summits leading to the true summit at the far end, but nobody in their right mind would climb up and over them these days, when there’s an easy traverse across snow to the left of them. I assume Imanishi and Gyaltsen were no fools. They would only have taken this route if the alternative was more difficult. The easy path in snow beside the fore-summits must have been very different in the drier conditions. 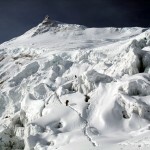 So what is the summit of Manaslu really like? You will get a different answer depending on who you ask. 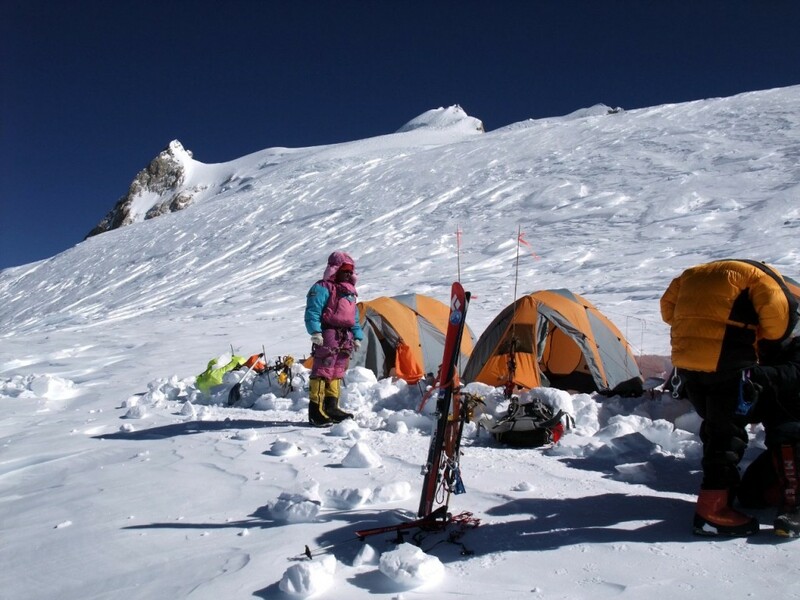 By chance there are teams on Manaslu right now, and I have been following the expedition dispatches from my old friends at Altitude Junkies, whom I climbed with in 2011. In their team is the respected mountaineering blogger Alan Arnette, who has been describing much drier conditions this year. Who knows, perhaps they will even get to see the stripy rock tower of 1956. The team set off from base camp on their summit push on Saturday, which means if things go to plan they will reach the summit today. I’m watching with interest. 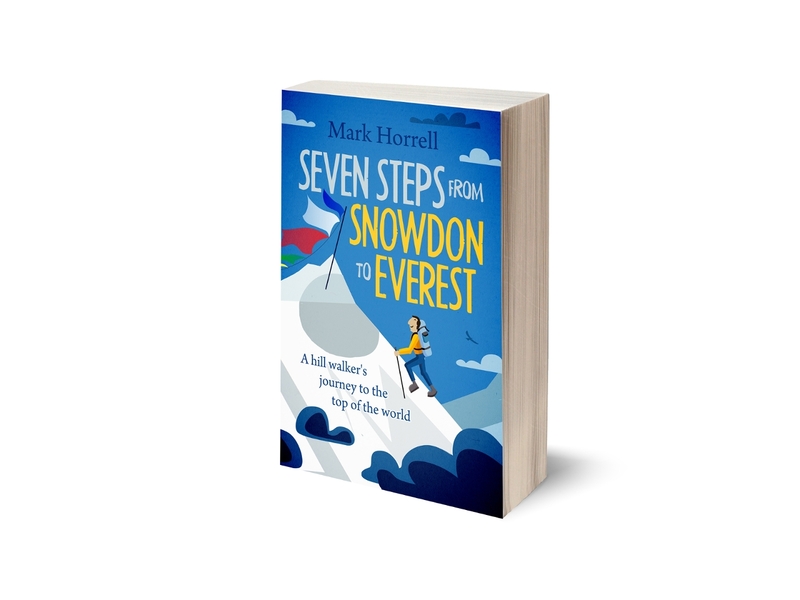 You can read more about my own ascent of Manaslu in the ebook of my expedition diary. I also summarised the expedition in a previous post. Or maybe you just want to look at the pictures. Interesting reading as always Mark! Well done. As they say you can never climb the same mountain twice!